What better way to celebrate American Independence Day on 4 July than with these home-made beefburgers? They are really quick and simple to make in advance, and are great for barbecuing. Made with British lean ground beef for a healthier choice, they will be popular with children and adults alike. Mix together the egg, beef, barbecue sauce and seasoning. Divide the meat mixture into 4 and form into burgers, approximately 9cm in diameter. Place the burgers under a preheated grill, on a medium setting, or on a preheated barbecue for 15-20 minutes turning once, or until thoroughly cooked and the juices run clear and there is no pink meat. Top the burgers with the slices of mozzarella. Meanwhile, bake the ciabatta rolls according to the pack instructions. 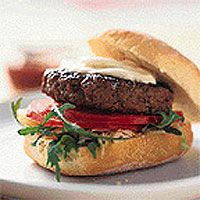 Serve the burgers in the halved rolls with a slice of tomato and a little shredded lettuce or salad leaves. Serve the burgers with salad and a selection of barbecue sauces and relishes. Try Jardine's Chicken 'N Ribs or Wild Harvest's Native Plum Sauce to add a real tang to your burgers, ribs or chicken. Wash work surfaces, chopping boards, utensils and hands thoroughly after handling raw meat. Take extra care when barbecuing meat and if possible cook it in the oven. Once cooked, place immediately on the barbecue to finish it off.